Mengzi (Chinese: 蒙自; pinyin: Méngzì) is a city in the southeast of Yunnan province, People's Republic of China. Administratively, it is a county-level city and the seat of the Honghe Hani and Yi Autonomous Prefecture, located about 175 kilometres (109 mi) south-southeast of the provincial capital of Kunming. It is situated in the centre of a fertile valley basin on a plateau 1,310 metres (4,300 ft) above sea level and was home to 417,156 inhabitants as of 2010 census. Mengzi was formerly Mengzi County (蒙自县) until October 2010, when it was upgraded to a county-level city. Not to be confused with Mangshi, a city in SW Yunnan. As with many other places in China, a variety of Romanized spellings were used for the name of Mengzi city in the past. The traditional French spelling was Mongtseu; the postal, Mengtsz, Mengtzu or Mongtze. Some works in English used the spelling Mêng-tse. or Mengtsze. The municipal seat is in Wenlan Town. Located within 30 arc minutes south of the Tropic of Cancer, Mengzi, as with much of southern Yunnan, has a warm humid subtropical climate (Köppen Cwa), with muddled distinction between the seasons and daytime temperatures remaining warm year-round. Highs peak in May before the core of the rainy season and reach a minimum in December; however, the warmest and coolest months are June and December, respectively at 24.0 °C (75.2 °F) and 13.2 °C (55.8 °F); the annual mean is 19.62 °C (67.3 °F). June thru September accounts for over 60% of the annual rainfall of 859 mm (33.8 in) and during this time, some rainfall occurs on a majority of days, resulting in a marked reduction in sunshine. With monthly percent possible sunshine ranging from 34% in June and July to 64% in February, the city receives 2,161 hours of bright sunshine annually. The Mengzi region is well known for a dish called guoqiao mixian ("Over the Bridge Rice Noodle"), made with long rice-flour noodles. In 2012 it became apparent that several sets of fossil hominins from Maludong near Mengzi City (some of them already in museum collections) might potentially belong to a new species of homo sapiens although only 11-14K years old. These are provisionally known as the Red Deer Cave people. In the 19th century, Mengzi was a trading centre for commerce between the interior of Yunnan and the Hanoi-Haiphong area of Vietnam. In 1886, a French convention chose Mengzi to be the center of trade in Yunnan province for importing and exporting goods via Tongking in Vietnam. Facilities for this opened 2 years later. Communications were inconvenient: goods from Hanoi or Haiphong were shipped to Hekou on the Vietnamese border by junk, transferred by small craft to Manhao, and then taken 60 km (37 mi) by pack animal to Mengzi. Despite these difficulties, Mengzi was an important port of entry into both Yunnan and western Guizhou provinces, and in 1889 it was opened to foreign trade as a treaty port. Most of this foreign trade was in tin and opium. Its main exports were tin and opium, and the main imports were mostly textiles (primarily cotton) and tobacco. As a trading center, the city gradually began to lose its importance beginning from the early 20th century. The importance of Mengzi was ended by the construction of the French railway from Haiphong to Kunming (the Yunnan provincial capital) in 1906–10. This railway bypassed Mengzi, but in 1915 a branch line was built via the town to the Gejiu tin mines. Apart from a brief respite during the early days of World War II, the town of Mengzi has, nevertheless, steadily declined in importance ever since. 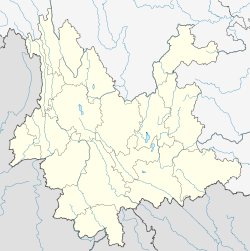 Gejiu became a county in 1913, and a city in 1951. With the improvement of communications and transportation between cities of Gejiu and Kaiyuan and the other counties nearby, plus the development of trade between southwestern China and the countries of Southeast Asia, Mengzi's ties have increasingly strengthened with Gejiu and Kaiyuan. The whole area has become a border economic centre. In addition to tin, the county's natural resources include coal, manganese, lead, zinc, and antimony. When Japanese troops drove Beijing and Tianjin university professors, students, and administrators out of those cities, and then later out of Changsha as well, the academics made their own long march to Yunnan Province. They first established themselves in Mengzi, but after a year or so moved on to the provincial capital, Kunming. This was Lianda, or the Southwest Associated Universities. Recently, the prefectural government has moved from nearby Gejiu to Mengzi. New wealthy suburbs and large government offices have sprung up as a result, but much of the poverty remains, creating a large wealth gap within the city. Like nearby Gejiu, mining, mostly of tin, is a large part of its economy. The Yuxi–Mengzi Railway (opened in 2013) and the Mengzi–Hekou Railway (opened in December 2014); regular passenger service between Kunming and Hekou. Honghe Mengzi Airport is scheduled to be built in Mengzi. A tram line is being built to better link the center with new quarters. Chisholm, Hugh, ed. (1911). "Mengtsze" . Encyclopædia Britannica. 18 (11th ed.). Cambridge University Press. p. 129. ^ "云南蒙自县申报设市获得国家民政部批复—". Sina.com. 13 October 2010. Retrieved 2011-03-22. ^ Little, Archibald John (2010), Little, Alicia, ed., Across Yunnan: A Journey of Surprises, Cambridge University Press, ISBN 1108014097 , originally published 1910. Pages 86 sq. ^ "Human fossils hint at new species". BBC. Retrieved 2012-03-14. ^ 云南“红河蒙自机场”获批 投资30亿元军民合用. China Daily (in Chinese). 2012-10-16. Archived from the original on 2013-05-28. Wikisource has the text of the 1905 New International Encyclopedia article Meng-tsze.